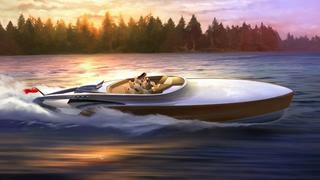 The Lymington-based studio Claydon Reeves last night unveiled its Aeroboat design – a sleek, fast day boat with an original Spitfire engine at its heart. The Rolls-Royce V12 Merlin engine in each 14.64m Aeroboat will be detuned from its ultra-high aeronautical power output to offer 1,500hp. With a bespoke gearbox and final drive, the yacht is expected to achieve speeds of more than 50 knots. Indeed, Aeroboat is an appealing synthesis of the classic and futuristic. It will be constructed from carbon fibre and Kevlar with a lightweight wood veneer sourced in Britain. The exterior design is modern but inspired by the flowing lines of the Spitfire. The design of the stern echoes the wing’s trailing edge, as does the sweeping tail and the authentic air intake scoop. The cockpit is based on a sports car design, with leather stitching and a wooden dashboard, and can be configured to accommodate four to seven passengers. The forward seats have a shock-mounted design inspired by the Spitfire landing gear. The console can be laid out with analogue gauges, touch-screens or a combination of both for command and navigation, and there’s an aircraft-inspired throttle and switchgear. Below decks the forward cabin includes a double berth and an en suite. Aeroboat has naval architecture by Claydon Reeves’ Lymington neighbours Laurent Giles and will be built at performance yacht builder Green Marine in Hythe, on the Solent – so a very British affair all together. Claydon Reeves is awaiting a client but hopes to build a limited edition of ten Aeroboats, costing £2 million to £3 million and tailored to the requirements of each client.